A Norse Creation Myth - Click HERE for the questions. 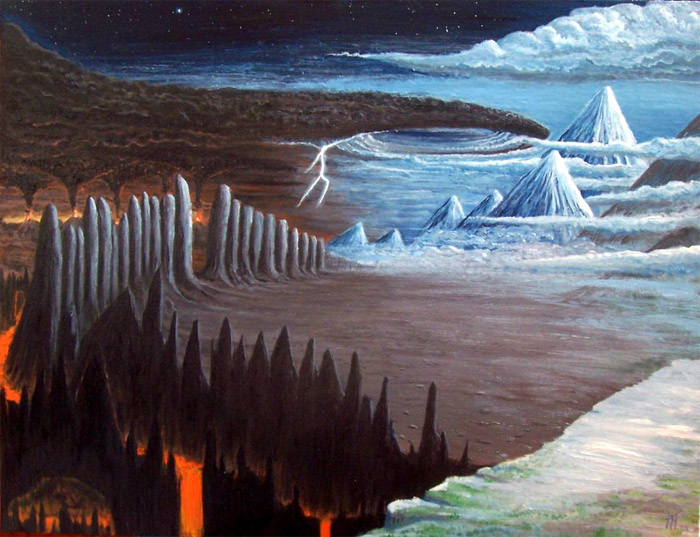 In the beginning there was Ginnungagap, a great emptiness between the icy Niflheim to the north and the molten Muspelheim to the south. There was no ocean, no shore, no sky, or earth in Ginnungagab, only a great emptiness and nothingness. As time went by Niflheim and Muspelheim started expanding into the empty Ginnungagab and where the ice and the heat met the ice melted and from the water and the sparks flying from Muspelheim life was created. The first two creatures were Ymer, a giant, and the cow Audhumbla. Ymer drank her milk and grew stronger as he did. Once when Ymer was sleeping the heat from Muspelheim made him sweat and from under each of his armpits a new life sprung forth, a man and a woman. In his sleep one of his feet started itching and he scratched it with the other foot and forth sprung a son. These three children became the first giants and they soon grew in number and their evil kind spread out fast. 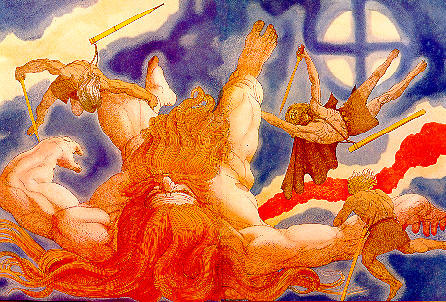 Odin, Vile, and Ve killed Ymer, for they feared he would father more terrible children. From him the world was created as the three gods threw his body into Ginnungagap and arranged it. His meat was used to make the earth, his blood filled the oceans, lakes, and rivers and all the giants except two, a man and a woman, drowned. His bones became mountains and his hair became the plants covering the earth. When they had used all but his skull they took it and placed it over the world they had created and it became the sky. To hold it up they placed four dwarves to hold it up. Auhumbla was licking a salty rock while sustaining Ymer with her milk. At the end of the first evening the hair of a man was licked free, on the second day his face was freed as well and on the third evening the entire man was freed. His name was Bure and he was both beautiful and strong. His son was Borr who married Bestla, and together they had three sons; Odin, Vile, and Ve. Their names are North, South, East, and West. Some of the sparks from Muspelheim they placed on the inner side of his skull and they became the stars and the sun and moon were created by sparks from Muspelheim as well. The clouds were made from Ymer’s brain. They way the gods arranged the world was so that they themselves lived in the middle of the world. They called this place Asgaard. Around their world was the world of the humans, called Middle Earth. 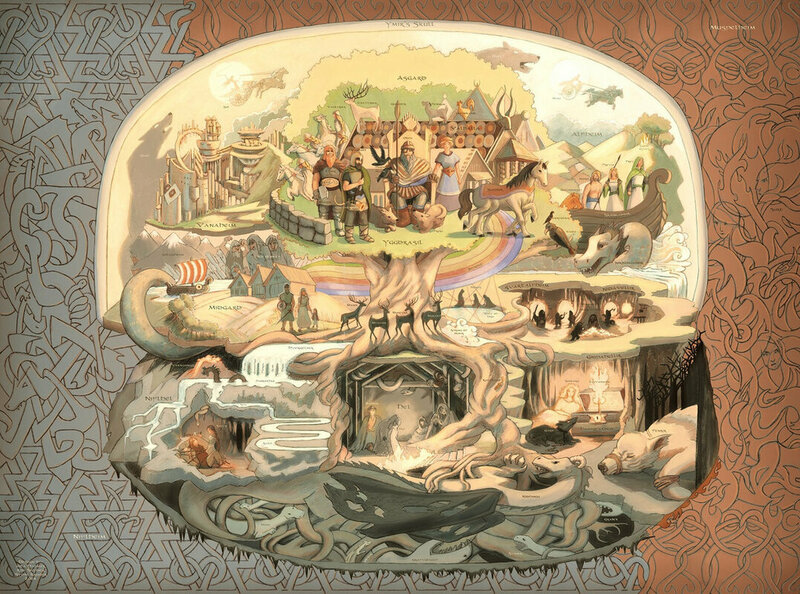 And outside this circle was the home of the giants, Jotunheim. To protect themselves and the humans the gods built a gigantic wall of Ymer’s eyelashes around Middle Earth so the giants would not be able to get in. 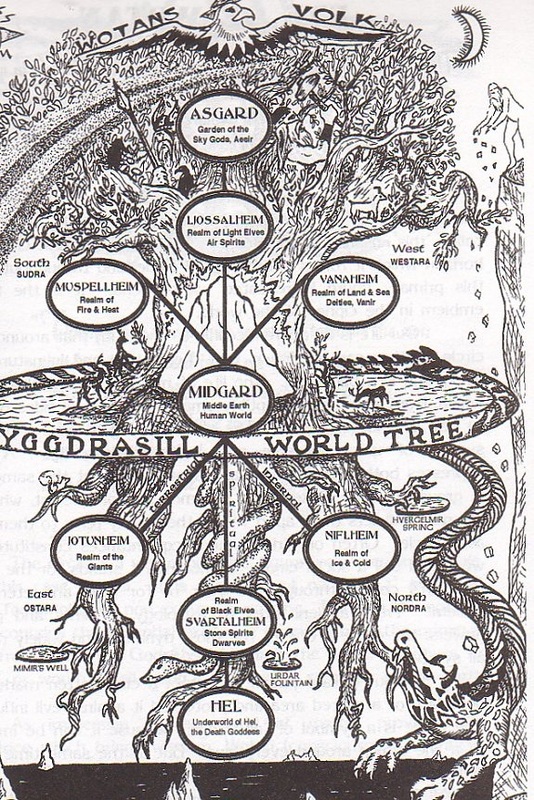 You could not go to Asgaard just by travelling on the ground, even though Middle Earth and Asgaard were connected. To get there you would have to walk over the rainbow which was called Bifrost. 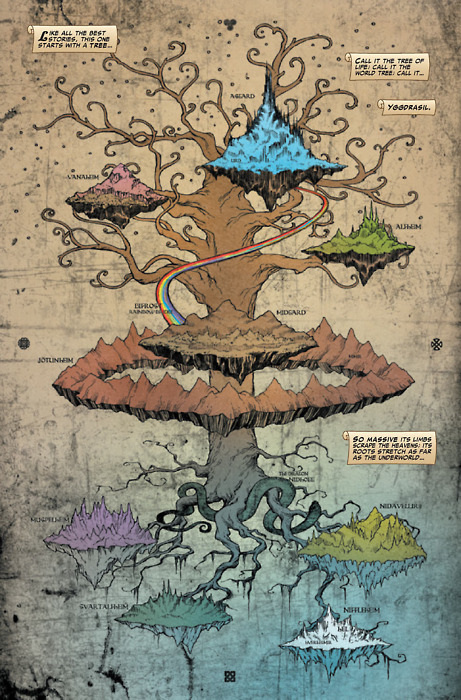 The most important thing in this new world however was the giant tree Yggdrasil, the Worldtree. It stood in the middle of the world and connected all the worlds. One day Odin, Vile, and Ve were walking at the shore and there they found two pieces of wood and they saw that they had been shaped by the sand so that they looked like a man and a woman, but they were noting but the image. So Ve gave them language and senses, Vile gave them consciousness and the ability to move, and last but not least, Odin gave them life and spirit. They named the man Ask and the woman Embla, they lived in Middle Earth and all humans originated from them. In Jotunheim there was a man who had a daughter who was dark and beautiful and he called her Night. Night married and got a son who was very light, but no less beautiful than his mother, he was called Day. Each day Night and Day ride over the sky on their horses and thus day and night was created. At the same time as Night and Day came into being there lived a man in Middle Earth who had two children and he thought they were so beautiful that he called his daughter Sun and his son Moon. This arrogance angered the gods and as a punishment they took the two children and gave them each a carriage and each day they drive over the sky with the real sun and moon. They must hurry though for behind them run two wolves who will catch up with them when the last battle comes and swallow them and the real sun and moon respectively. Now the gods looked upon the world that they had created, but then they noticed that the meat that they made the earth of was rotting in some places and that maggots were eating it, so to remedy the situation the gods made the maggots into dwarves and that is how they came into being. One of the Giants took up his place far to the north and there he sits in his eagle-slough and when he flaps his wings storms are created and many a ship has sunk because of him.